With 60 minutes of television time and a lightweight top contender bout at their disposal, many fans were upset the UFC and FOX opted to only feature the heavyweight title tilt between Junior dos Santos and Cain Velasquez during Saturday’s hour-long broadcast – particularly since nobody expected the championship affair to go the entire five rounds. For the ungrateful moochers complaining about freebie fights, UFC president Dana White (Pictured) would like to remind you last night’s show was a bonus because their partnership with FOX doesn’t technically start until January. He also had some harsh words for you. “I said it in the first press conference, this thing could go 30 seconds or this thing could go 25 minutes. Either way, it’ll be a great fight and it was,” White said at the post-fight press conference. “That’s what happens when you put two heavyweights in there who bang. Anything can happen. There’s nothing you can do about that. We can’t control the fights. Although Fox Sports chief executive David Hill was pleased with their mixed martial arts premiere, he admitted things could have been done differently. “It absolutely delivered everything I hoped it would,” Hill told ESPN.com. 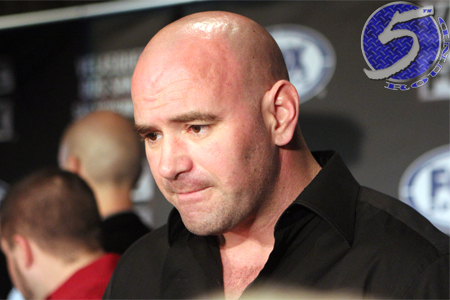 “I spoke to Dana and maybe, tactically, Dana didn’t play it the right way. But this is what you get in this sport. This is world heavyweight champion action. It certainly didn’t help matters that the co-main event between Ben Henderson and Clay Guida was a thrilling affair that earned ‘Fight of the Night‘ honors, but of course hindsight is always 20/20. At the end of the day, the featured fight did what it was supposed to do, provide a spectacular finish while giving the UFC access to an unprecedented amount of eyeballs.